Lee Lifting Services has many years of experience both planning and executing many different types of lifting operations in an extensive range of locations and environments. 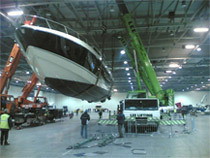 Here are a few of the unusual ones but rest assured we carry out many more “typical” crane operations. 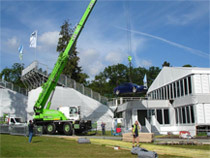 From your initial enquiry we aim to provide helpful and practical advice regarding crane size and application, we are also more than happy to visit your site to further advise you on your exact requirements. Our equipment is serviced and independently inspected on a regular basis to comply with the latest safety regulations. All staff hold industry recognised qualifications and as importantly have a high level of practical knowledge and experience to enable even the most challenging projects to carried out in a safe controlled manner. David Jones a bespoke furniture maker from Isleworth in West London began the construction of a replica Viking boat in his back garden in April 2004. 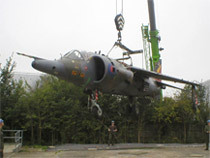 On the 11th June 2005 ‘Lille Draken’ (little dragon) took to the skies, plucked from the street over the house suspended from a crane as the only way to freedom. The boat then embarked on a number of guest appearances including Richard & Judy. The full story of Lille Draken can be seen at David Jones. As part of ‘Celebrate Oxford Street’ day, Lee Lifting Services were approached to suspend a human mobile of French Musicians. 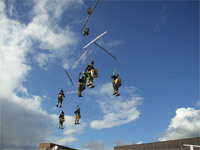 The 6 piece band and trapeze artist had to appear over the top of the buildings to entertain the crowds of onlookers below and then disappear back over the horizon of a busy city street.